For other uses, see Fresco (disambiguation). Fresco (plural frescos or frescoes) is a technique of mural painting executed upon freshly laid, or wet lime plaster. Water is used as the vehicle for the dry-powder pigment to merge with the plaster, and with the setting of the plaster, the painting becomes an integral part of the wall. 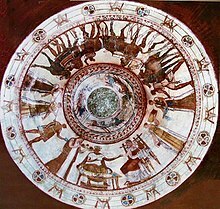 The word fresco (Italian: affresco) is derived from the Italian adjective fresco meaning "fresh", and may thus be contrasted with fresco-secco or secco mural painting techniques, which are applied to dried plaster, to supplement painting in fresco. The fresco technique has been employed since antiquity and is closely associated with Italian Renaissance painting. In painting buon fresco, a rough underlayer called the arriccio is added to the whole area to be painted and allowed to dry for some days. Many artists sketched their compositions on this underlayer, which would never be seen, in a red pigment called sinopia, a name also used to refer to these under-paintings. Later,[when? ]new techniques for transferring paper drawings to the wall were developed. The main lines of a drawing made on paper were pricked over with a point, the paper held against the wall, and a bag of soot (spolvero) banged on them on produce black dots along the lines. If the painting was to be done over an existing fresco, the surface would be roughened to provide better adhesion. On the day of painting, the intonaco, a thinner, smooth layer of fine plaster was added to the amount of wall that was expected to be completed that day, sometimes matching the contours of the figures or the landscape, but more often just starting from the top of the composition. This area is called the giornata ("day's work"), and the different day stages can usually be seen in a large fresco, by a sort of seam that separates one from the next. Buon frescoes are difficult to create because of the deadline associated with the drying plaster. Generally, a layer of plaster will require ten to twelve hours to dry; ideally, an artist would begin to paint after one hour and continue until two hours before the drying time—giving seven to nine hours' working time. Once a giornata is dried, no more buon fresco can be done, and the unpainted intonaco must be removed with a tool before starting again the next day. If mistakes have been made, it may also be necessary to remove the whole intonaco for that area—or to change them later, a secco. An indispensable component of this process is the carbonatation of the lime, which fixes the colour in the plaster ensuring durability of the fresco for future generations. A technique used in the popular frescoes of Michelangelo and Raphael was to scrape indentations into certain areas of the plaster while still wet to increase the illusion of depth and to accent certain areas over others. The eyes of the people of the School of Athens are sunken-in using this technique which causes the eyes to seem deeper and more pensive. Michelangelo used this technique as part of his trademark 'outlining' of his central figures within his frescoes. In a wall-sized fresco, there may be ten to twenty or even more giornate, or separate areas of plaster. After five centuries, the giornate, which were originally nearly invisible, have sometimes become visible, and in many large-scale frescoes, these divisions may be seen from the ground. Additionally, the border between giornate was often covered by an a secco painting, which has since fallen off. One of the first painters in the post-classical period to use this technique was the Isaac Master (or Master of the Isaac fresco, and thus a name used to refer to the unknown master of a particular painting) in the Upper Basilica of Saint Francis in Assisi. A person who creates fresco is called a frescoist. A secco or fresco-secco painting is done on dry plaster (secco meaning "dry" in Italian). The pigments thus require a binding medium, such as egg (tempera), glue or oil to attach the pigment to the wall. It is important to distinguish between a secco work done on top of buon fresco, which according to most authorities was in fact standard from the Middle Ages onwards, and work done entirely a secco on a blank wall. Generally, buon fresco works are more durable than any a secco work added on top of them, because a secco work lasts better with a roughened plaster surface, whilst true fresco should have a smooth one. The additional a secco work would be done to make changes, and sometimes to add small details, but also because not all colours can be achieved in true fresco, because only some pigments work chemically in the very alkaline environment of fresh lime-based plaster. Blue was a particular problem, and skies and blue robes were often added a secco, because neither azurite blue nor lapis lazuli, the only two blue pigments then available, works well in wet fresco. It has also become increasingly clear, thanks to modern analytical techniques, that even in the early Italian Renaissance painters quite frequently employed a secco techniques so as to allow the use of a broader range of pigments. In most early examples this work has now entirely vanished, but a whole painting done a secco on a surface roughened to give a key for the paint may survive very well, although damp is more threatening to it than to buon fresco. A third type called a mezzo-fresco is painted on nearly dry intonaco—firm enough not to take a thumb-print, says the sixteenth-century author Ignazio Pozzo—so that the pigment only penetrates slightly into the plaster. By the end of the sixteenth century this had largely displaced buon fresco, and was used by painters such as Gianbattista Tiepolo or Michelangelo. This technique had, in reduced form, the advantages of a secco work. The three key advantages of work done entirely a secco were that it was quicker, mistakes could be corrected, and the colours varied less from when applied to when fully dry—in wet fresco there was a considerable change. For wholly a secco work, the intonaco is laid with a rougher finish, allowed to dry completely and then usually given a key by rubbing with sand. The painter then proceeds much as he would on a canvas or wood panel. An old fresco is the Investiture of Zimri-Lim from Syria, dating from the early 18th century BC. In contrast, Ancient Egyptians painted many tombs and houses, but those wall paintings are not frescoes. 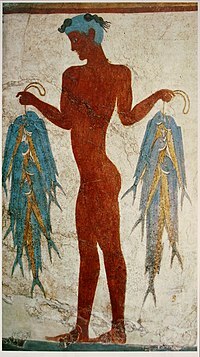 The oldest frescoes done in the Buon Fresco method date from the first half of the second millennium BCE during the Bronze Age and are to be found among Aegean civilizations, more precisely the Minoan culture from the island of Crete and other islands of the Aegean Sea. The most famous of these, The Toreador, depicts a sacred ceremony in which individuals jump over the backs of large bulls. The oldest surviving Minoan frescoes are found on the island of Santorini (classically known as Thera), dated to the Neo-Palatial period (c. 1640–1600 BC). While some similar frescoes have been found in other locations around the Mediterranean basin, particularly in Egypt and Morocco, their origins are subject to speculation. Some art historians believe that fresco artists from Crete may have been sent to various locations as part of a trade exchange, a possibility which raises to the fore the importance of this art form within the society of the times. The most common form of fresco was Egyptian wall paintings in tombs, usually using the a secco technique. Frescoes were also painted in ancient Greece, but few of these works have survived. In southern Italy, at Paestum, which was a Greek colony of the Magna Graecia, a tomb containing frescoes dating back to 470 BC, the so-called Tomb of the Diver was discovered in June 1968. These frescoes depict scenes of the life and society of ancient Greece, and constitute valuable historical testimonials. One shows a group of men reclining at a symposium while another shows a young man diving into the sea. 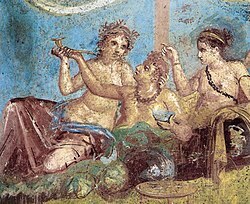 Etruscan frescoes, dating from the 4th century BCE, have been found in the Tomb of Orcus near Veii, Italy. The richly decorated Thracian frescoes of the Tomb of Kazanlak are dating back to 4th century BC, making it a UNESCO protected World Heritage Site. Late Roman Empire (Christian) 1st-2nd-century frescoes were found in catacombs beneath Rome, and Byzantine Icons were also found in Cyprus, Crete, Ephesus, Cappadocia, and Antioch. Roman frescoes were done by the artist painting the artwork on the still damp plaster of the wall, so that the painting is part of the wall, actually colored plaster. Thanks to large number of ancient rock-cut cave temples, valuable ancient and early medieval frescoes have been preserved in more than 20 locations of India. The frescoes on the ceilings and walls of the Ajanta Caves were painted between c. 200 BC and 600 and are the oldest known frescoes in India. They depict the Jataka tales that are stories of the Buddha's life in former existences as Bodhisattva. The narrative episodes are depicted one after another although not in a linear order. Their identification has been a core area of research on the subject since the time of the site's rediscovery in 1819. Other locations with valuable preserved ancient and early medieval frescoes include Bagh Caves, Ellora Caves, Sittanavasal, Armamalai Cave, Badami Cave Temples and other locations. 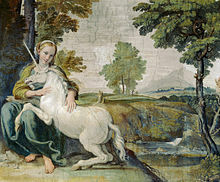 Frescoes have been made in several techniques, including tempera technique. The later Chola paintings were discovered in 1931 within the circumambulatory passage of the Brihadisvara Temple in India and are the first Chola specimens discovered. Researchers have discovered the technique used in these frescos. A smooth batter of limestone mixture was applied over the stones, which took two to three days to set. Within that short span, such large paintings were painted with natural organic pigments. During the Nayak period, the Chola paintings were painted over. The Chola frescos lying underneath have an ardent spirit of saivism expressed in them. They probably synchronised with the completion of the temple by Rajaraja Cholan the Great. The frescoes in Dogra/ Pahari style paintings exist in their unique form at Sheesh Mahal of Ramnagar (105 km from Jammu and 35 km west of Udhampur). Scenes from epics of Mahabharat and Ramayan along with portraits of local lords form the subject matter of these wall paintings. Rang Mahal of Chamba (Himachal Pradesh) is another site of historic Dogri fresco with wall paintings depicting scenes of Draupti Cheer Haran, and Radha- Krishna Leela. This can be seen preserved at National Museum at New Delhi in a chamber called Chamba Rang Mahal. The Sigiriya Frescoes are found in Sigiriya in Sri Lanka. Painted during the reign of King Kashyapa I (ruled 477 — 495 AD). The generally accepted view is that they are portrayals of women of the royal court of the king depicted as celestial nymphs showering flowers upon the humans below. They bear some resemblance to the Gupta style of painting found in the Ajanta Caves in India. They are, however, far more enlivened and colorful and uniquely Sri Lankan in character. They are the only surviving secular art from antiquity found in Sri Lanka today. The painting technique used on the Sigiriya paintings is "fresco lustro". It varies slightly from the pure fresco technique in that it also contains a mild binding agent or glue. This gives the painting added durability, as clearly demonstrated by the fact that they have survived, exposed to the elements, for over 1,500 years. Located in a small sheltered depression a hundred meters above ground only 19 survive today. Ancient references, however, refer to the existence of as many as five hundred of these frescoes. The late Medieval period and the Renaissance saw the most prominent use of fresco, particularly in Italy, where most churches and many government buildings still feature fresco decoration. This change coincided with the reevaluation of murals in the liturgy. Romanesque churches in Catalonia were richly painted in 12th and 13th century, with both decorative and educational—for the illiterate faithfuls—roles, as can be seen in the MNAC in Barcelona, where is kept a large collection of Catalan romanesque art. In Denmark too, church wall paintings or kalkmalerier were widely used in the Middle Ages (first Romanesque, then Gothic) and can be seen in some 600 Danish churches as well as in churches in the south of Sweden, which was Danish at the time. One of the rare examples of Islamic fresco painting can be seen in Qasr Amra, the desert palace of the Umayyads in the 8th century Magotez. Northern Romania (historical region of Moldavia) boasts about a dozen painted monasteries, completely covered with frescos inside and out, that date from the last quarter of the 15th century to the second quarter of the 16th century. The most remarkable are the monastic foundations at Voroneţ (1487), Arbore (1503), Humor (1530), and Moldoviţa (1532). Suceviţa, dating from 1600, represents a late return to the style developed some 70 years earlier. The tradition of painted churches continued into the 19th century in other parts of Romania, although never to the same extent. Henri Clément Serveau produced several frescos including a three by six meter painting for the Lycée de Meaux, where he was once a student. He directed the École de fresques at l'École nationale supérieure des beaux-arts, and decorated the Pavillon du Tourisme at the 1937 Exposition Internationale des Arts et Techniques dans la Vie Moderne (Paris), Pavillon de la Ville de Paris; now at Musée d'Art Moderne de la Ville de Paris. In 1954 he realized a fresco for the Cité Ouvrière du Laboratoire Débat, Garches. He also executed mural decorations for the Plan des anciennes enceintes de Paris in the Musée Carnavalet. The Foujita chapel in Reims completed in 1966, is an example of modern frescos, the interior being painted with religious scenes by the School of Paris painter Tsuguharu Foujita. In 1996, it was designated an historic monument by the French government. José Clemente Orozco, Fernando Leal, David Siqueiros and Diego Rivera the famous Mexican artists, renewed the art of fresco painting in the 20th century. Orozco, Siqueiros, Rivera and his wife Frida Kahlo contributed more to the history of Mexican fine arts and to the reputation of Mexican art in general than anybody else. Together with works by Orozco, Siqueiros, and others, Fernando Leal and Rivera's large wall works in fresco established the art movement known as Mexican Muralism. Colombia Santiago Martinez Delgado frescoed a mural in the Colombian Congress Building, and also in the Colombian National Building. The climate and environment of Venice has proved to be a problem for frescoes and other works of art in the city for centuries. The city is built on a lagoon in northern Italy. The humidity and the rise of water over the centuries have created a phenomenon known as rising damp. As the lagoon water rises and seeps into the foundation of a building, the water is absorbed and rises up through the walls often causing damage to frescoes. Venetians have become quite adept in the conservation methods of frescoes. The mold aspergillus versicolor can grow after flooding, to consume nutrients from frescoes. The following is the process that was used when rescuing frescoes in La Fenice, a Venetian opera house, but the same process can be used for similarly damaged frescoes. First, a protection and support bandage of cotton gauze and polyvinyl alcohol is applied. Difficult sections are removed with soft brushes and localized vacuuming. The other areas that are easier to remove (because they had been damaged by less water) are removed with a paper pulp compress saturated with bicarbonate of ammonia solutions and removed with deionized water. These sections are strengthened and reattached then cleansed with base exchange resin compresses and the wall and pictorial layer were strengthened with barium hydrate. The cracks and detachments are stopped with lime putty and injected with an epoxy resin loaded with micronized silica. The Chapel of the Holy Cross in Wawel Cathedral in Kraków is decorated with Byzantine Frescoes. ^ Mora, Paolo; Mora, Laura; Philippot, Paul (1984). Conservation of Wall Paintings. Butterworths. pp. 34–54. ISBN 0-408-10812-6. ^ Ward, Gerald W. R., ed. (2008). The GroveEncyclopedia of Materials and Techniques in Art. Oxford University Press. pp. 223–5. ISBN 978-0-19-531391-8. ^ Mora, Paolo; Mora, Laura; Philippot, Paul (1984). Conservation of Wall Paintings. Butterworths. pp. 47–54. ISBN 0-408-10812-6. ^ How is a fresco made? - Fresco Blog by Italian Fresco Blog. ^ All this section - Ugo Procacci, in Frescoes from Florence, pp. 15-25 1969, Arts Council, London. ^ Ancient and medieval Indian cave paintings - Internet encyclopedia by Wondermondo. Retrieved 4 June 2010. ^ Ponnamperuma, Senani (2013). Story of Sigiriya. Melbourne: Panique Pty Ltd. ISBN 9780987345110. ^ Español, Francesca; Yarza, Joaquín; fotografies de Ramon Manent, Pere Pascual i Rosina Ramírez (2007). El romànic català (in Catalan) (1. ed.). Barcelona: Angle Editorial. ISBN 9788496970090. ^ Kirsten Trampedach, "Introduction to Danish wall paintings - Conservation ethics and methods of treatment from the National Museum of Denmark" Archived 24 November 2009 at the Wayback Machine. Retrieved 2 March 2010. ^ Orio Ciferri (March 1999). "Microbial Degradation of Paintings". Applied and Environmental Microbiology. 65 (3): 879–885. PMC 91117. PMID 10049836. ^ Ciacci, Leonardo., ed, La Fenice Reconstructed 1996–2003: a building site in the city, (Venezia: Marsilio, 2003),118. Wikimedia Commons has media related to Frescos.